e-Gov for Mining solutions take management of mineral rights to the next level by improving stakeholder communications, providing live access to cadastre information, and streamlining licensing processes. The management of mineral rights can be a time and resource intensive activity, particularly when processes are manual and/or paper-based. Government agencies working with an abundance of extractive industry stakeholders require a solution to efficiently communicate with stakeholders in a timely, transparent manner, while also making mining cadastre information available to investors. The e-Gov for Mining solution is a secure, web-based, e-Government system through which companies and individuals are able to administer their mineral rights online. These solutions allow all registered stakeholders to interact directly with the Government to undertake activities such as the submission of new applications, online payments, uploading of statutory reports, undertaking renewals, transfers and relinquishments. 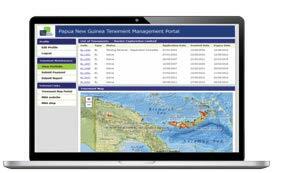 Also available are Mining Cadastre Map Portals, which provide a spatial view into the mining cadastre data. When coupled with Landfolio® software for natural resource applications as the government’s back-office mining cadastre system, the e-Gov for Mining solution takes management of mineral rights to the next level. There are significant benefits of the e-Gov for Mining solution for both government agencies and their industry stakeholders. e-Gov for Mining benefits a country’s extractives industry by providing a transparent channel for communication between the government and its stakeholders.